The NAACP Alaska-Oregon-Washington State Conference stands behind Ms. Dolezal’s advocacy record. In every corner of this country, the NAACP remains committed to securing political, educational, and economic justice for all people, and we encourage Americans of all stripes to become members and serve as leaders in our organization. A Washington state NAACP president is in the midst of controversy concerning, mainly, her race, with her biological, white parents accusing her of falsely portraying herself as black for almost a decade, the Spokesman-Review reports. Rachel Dolezal’s mother said that she hasn’t had any contact with her daughter in years, but acknowledged that her daughter began to “disguise herself” in 2006 or 2007, after the family adopted four young black children, one of whom her daughter eventually began passing off as her own son. Dolezal, 37, who also is a part-time professor in the Africana-studies program at Eastern Washington University, had initially evaded questions regarding her race and alleged deceit, telling the Spokesman-Review Thursday that she feels as if she owes the “executive committee a conversation” before broadening her engagement in the “multilayered” issue. Dolezal has claimed to be the victim of hate crimes in the past, most recently in February and March of this year, when she reported receiving a hate-mail package. Police records note that the initial package that Dolezal said she received did not have a date stamp or a bar code, which she acknowledged to the police when she first reported it. However, postal workers interviewed by investigators have said that it was very unlikely—nearly impossible—that the package would have been processed through the post office, concluding that the only other way for it to have been delivered to Dolezal was if someone who had a mailbox key put it there. However, the Spokesman-Review reported other pieces of mail with the same handwriting and style, sent by the same person identifying him- or herself as “War Pig (Ret. ),” had been previously received by Dolezal, probably date-stamped and postmarked from Oakland, Calif. 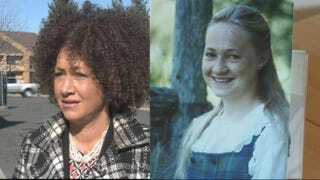 According to the Spokesman-Review, Dolezal has been credited with re-energizing the local NAACP and also serves as chairwoman of the Spokane Office of Police Ombudsman Commission, where she identified herself as white, black and American Indian on her application for the volunteer appointment. Ruthanne Dolezal said that the family’s background is mostly Czech, Swedish and German, with some “faint traces” of Native American ancestry. Read more at the Spokesman-Review and KREM2.